Sometimes you come across a really fabulous editorial in a magazine that really stands out and makes you appreciate the hard work and attention to detail that must have gone into it. In this months Vogue Paris, I completely fell in love with their edit titled 'Panoplies' which has models dressed eerily (and completely believably I must add) as Barbie dolls. Each doll is boxed and clad in the designers representative SS15 collection with matching accessories dotted around the box. The attention to detail is amazing! 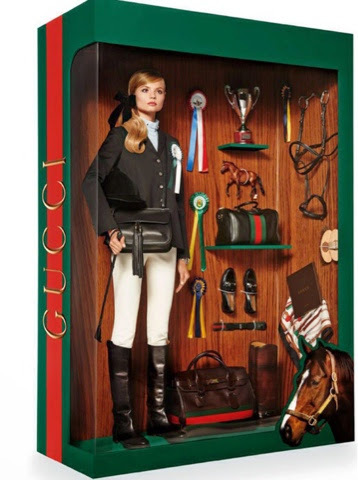 Photographed by Giampaolo Sgura and modelled by 'doll face' models Magdalena Frackowiak and Elisabeth Erm, this was one spread where I actually spent ages poring over and savouring - I so want one of those dolls!! I wouldn't be surprised if the designers themselves took inspiration from this and decide to bring out limited edition dolls from their collection....Barbie Dolls for adults, who wouldn't want one?!!! Below are some of the pictures from the editorial for Vogue Paris that was styled by Claire Dhelens & Celia Azoulay. My favourites are Ralph Lauren (above), Chanel, Dior, and Valentino. The pursuit of...Shoes, Sparkle and Festive Fun!